Detecting pathogens and mounting immune responses upon infection is crucial for animal health. However, these responses come at a high metabolic price (McKean and Lazzaro, 2011, Kominsky et al., 2010), and avoiding pathogens before infection may be advantageous. The bacterial endotoxins lipopolysaccharides (LPS) are important immune system infection cues (Abbas et al., 2014), but it remains unknown whether animals possess sensory mechanisms to detect them prior to infection. Here we show that Drosophila melanogaster display strong aversive responses to LPS and that gustatory neurons expressing Gr66a bitter receptors mediate avoidance of LPS in feeding and egg laying assays. We found the expression of the chemosensory cation channel dTRPA1 in these cells to be necessary and sufficient for LPS avoidance. Furthermore, LPS stimulates Drosophila neurons in a TRPA1-dependent manner and activates exogenous dTRPA1 channels in human cells. Our findings demonstrate that flies detect bacterial endotoxins via a gustatory pathway through TRPA1 activation as conserved molecular mechanism. An immune system can fight bacterial infections, ensuring an animal’s health and survival. However, mounting an immune response to a bacterial infection requires a lot of energy. It also can be potentially dangerous if the immune system becomes too active. Therefore, avoiding bacteria and not getting infected to begin with may be a better strategy to stay healthy. Fruit flies, like humans, can detect dangerous substances in the environment via their sense of smell, but it is not known whether they also detect disease-causing organisms through their sense of taste. Bacterial molecules called lipopolysaccharides (LPS) can alert the immune system to the presence of dangerous bacteria. Previous studies have found that when flies get in contact with LPS they begin cleaning themselves, which might help prevent infection. However it was not clear how the flies actually detected the LPS. Now, Soldano et al. show that fruit flies can taste LPS and avoid eating or laying eggs on food contaminated with LPS and bacteria. A series of experiments showed that when a fly tastes LPS it stimulates bitter-sensing neurons in the fly’s mouth and throat. The experiments also revealed that the protein that activates these neurons in response to LPS is the same protein that acts in humans as detector of pungent chemicals contained in ordinary food items like mustard, garlic and wasabi. This suggests this protein, called TRPA1, is part of a key survival mechanism that has been preserved in many species throughout evolution. Soldano et al. showed that a fly’s senses and nervous system are actively involved in protecting it from bacterial infection. This is particularly important to flies, because unlike humans they don’t develop resistance to future infections with the same bacteria. Future studies are needed to determine if flies use their sense of taste to detect other chemicals that are signs of infections. Additionally, studies are needed to determine if the activated bitter-sensing nerves alert the fly’s immune system to a potential infection. In the past decade, increasing attention has been paid to the interactions between the immune and nervous systems (McMahon et al., 2015). In particular, there is evidence that sensory neurons can directly detect bacterial components as potentially damaging stimuli, and initiate acute inflammatory and nocifensive responses (Chiu et al., 2013; Meseguer et al., 2014). It has been shown that the Gram-negative bacterial wall component LPS induces hygienic grooming in Drosophila, an important behavioral defense against pathogens, via contact chemosensation (Yanagawa et al., 2014). Thus, LPS may represent important sensory cues of food contamination with Gram-negative bacteria. To test whether LPS can be perceived by flies during food ingestion we used a binary food choice assay (Isono and Morita, 2010) (Figure 1—figure supplement 1A). We found that control flies displayed significant avoidance towards food supplemented with LPS (Figure 1A and Figure 1—figure supplement 1B). Because LPS is non-volatile we determined if this avoidance is mediated by gustatory neurons known to detect aversive compounds (Gr66a) (Marella et al., 2006). Blocking neurotransmission in these neurons by expressing the light chain of tetanus toxin (TNT) abolished avoidance of LPS (Figure 1B), indicating that flies can detect LPS through a gustatory mechanism. Gustatory dTrpA1-dependent avoidance of LPS in Drosophila melanogaster. (A,C) Preference index (PI) of control CS10w1118 (A) and dTrpA1-deficient (C) male flies for control food over LPS-supplemented food. PI was calculated for the consumption of the control solution mixed with the color of the corresponding data symbol (n ≥ 6). (B) PI for control food of Gr66a>TNT flies and in the corresponding driver-only and responder-only control flies (n ≥ 6). (D) PI for control food of Gr66a>dTrpA1 RNAi flies (n ≥ 4–8). (E) Rescue of LPS avoidance in dTrpA11/dTrpA1ins; dTrpA1>dTrpA1 and dTrpA11/dTrpA1ins; Gr66a>dTrpA1-A/B flies (n ≥ 5). *P < 0.05; **P < 0.01; ***P < 0.001; ‘ns’, P > 0.05 (two-tailed Mann-Whitney U test). #, statistically significant differences from the no-preference zero level (two-tailed t test). A subset of Gr66a neurons innervating the labral sense organ and the labellum express TRPA1 (Kim et al., 2010; Kang et al., 2011), a chemosensory cation channel (Story et al., 2003; Nilius et al., 2012; Zygmunt and Högestätt, 2014) that mediates acute nocifensive responses to LPS in mice (Meseguer et al., 2014) and avoidance of bitter and noxious compounds in Drosophila (Kim et al., 2010; Kang et al., 2010; Du et al., 2015). We tested whether TRPA1 mediates gustatory avoidance of LPS in flies. We found that loss of dTrpA1 (w1118;dTrpA11, Figure 1C and dTrpA11/dTrpA1ins, Figure 1—figure supplement 1C) and pan-neuronal dTrpA1 knockdown by two independent RNAi lines (Figure 1—figure supplement 1D) lead to impaired avoidance of LPS. Therefore, neuronal expression of dTrpA1 is required for LPS avoidance. Furthermore, Gr66a-specific knockdown of dTrpA1 abolished the LPS-induced behavior (Figure 1D), and restoration of dTrpA1 expression using either of two different dTrpA1 isoforms (A and B) in the entire dTrpA1 pattern or only in Gr66a gustatory neurons of dTrpA11/dTrpA1ins flies rescued the avoidance of LPS (Figure 1E). Female flies use gustatory detection of non-volatile compounds via Gr66a neurons to select oviposition sites (Joseph and Heberlein, 2012). In a binary oviposition choice assay control females showed preference for control food over food supplemented with LPS (Figure 2A). This behavior was lost in dTrpA1-/- flies (Figure 2A), upon silencing Gr66a-expressing neurons (Figure 2B), and in Gr66a-specific dTrpA1 knockdown flies (Figure 2C). Altogether, these data show that LPS is avoided during feeding and oviposition and that dTrpA1 expression in bitter-sensing gustatory neurons is necessary and sufficient for LPS avoidance. These data indicate that a TRPA1-dependent mechanism of avoidance of LPS may serve flies to prevent infection with Gram-negative bacteria. Indeed, we found that control animals, but not dTrpA1-/- mutants, preferred laying eggs on control food, rather than on food contaminated with E. coli (Figure 2D). 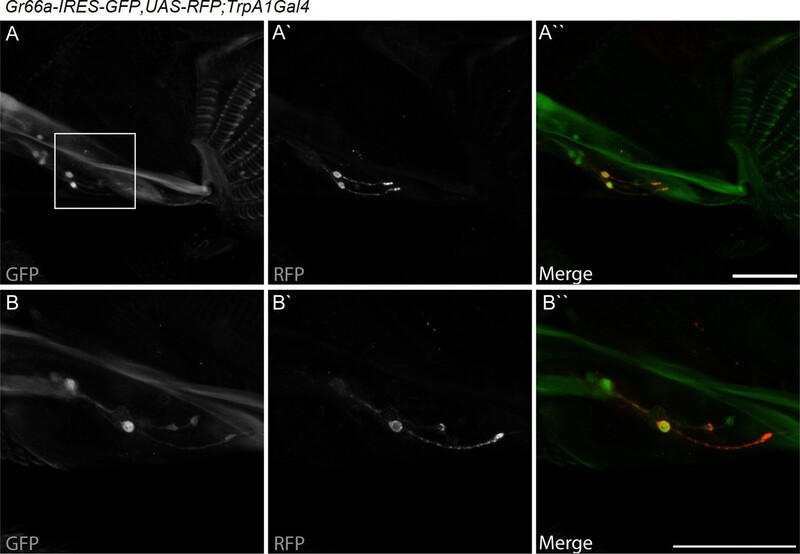 dTrpA1 expression in gustatory neurons is required for avoidance of LPS during oviposition. (A) Preference index for oviposition in control food of wild type versus dTrpA1-/- flies (n ≥ 5). (B) Oviposition preference of Gr66a>TNT flies (n ≥ 6). (C) Oviposition preference of Gr66a>dTrpA1 RNAi flies (n ≥ 6). (D) Oviposition preference of wild type versus dTrpA1-/- flies in presence of E. coli. (n ≥ 8) *P < 0.05; **P < 0.01; ***P < 0.001 (two-tailed Mann-Whitney U test). #, statistically significant differences from the no-preference zero level (two-tailed t test). dTRPA1 is expressed in the mouthpart in a subset of gustatory neurons in the esophagus (Figure 3A,B and Kang et al., 2010) and in a few neurons in the labellum that also express Gr66a (data not shown and Kang et al., 2011). However, no co-localization between dTrpA1 and Gr66a was observed in the leg (Figure 3—figure supplement 1). To test whether avoidance of LPS is mediated by labellar or esophageal chemosensors we performed a proboscis extension reflex (PER) assay in wild type animals. LPS did not inhibit PER (Figure 3—figure supplement 2), suggesting that avoidance of LPS is not mediated by the labellar neurons, but by the gustatory neurons of the esophagus. We attempted to record neuronal responses in these neurons using flies expressing the genetically encoded Ca2+ indicator GCaMP6m in Gr66a neurons but Ca2+ imaging access to these neurons proved impossible in our assays. Next, we attempted direct brain stimulation. All preparations (5/5) responded robustly to the application of the dTRPA1 agonist allyl isothiocyanate (AITC) or the classical bitter compound caffeine, indicating that they were healthy. However, application of LPS gave varying results (small responses in 40% (2/5) of the flies; data not shown) precluding definitive conclusions. Therefore, in order to further test whether dTRPA1 mediates responses to LPS in vivo we monitored intracellular Ca2+ dynamics in the ventral nerve cord of larvae, a preparation that allows better accessibility of chemical stimuli. Application of LPS or the dTRPA1 agonist allyl isothiocyanate (AITC) induced robust Ca2+ responses, effects that were strongly reduced by incubation with the TRPA1 inhibitor HC030031 (Figure 4—figure supplement 1). In contrast, HC030031 did not affect the responses to a depolarizing solution containing high K+ concentration. dTrpA1 is expressed in a subset of Gr66a-expressing neurons that can be directly stimulated by LPS. (A) Immunofluorescence analysis of Gr66a-IRES-GFP,UAS-RFP;dTrpA1Gal4 adult proboscis. Anti-GFP immunohistochemistry (in green in the Merge panel) labels taste neurons while anti-RFP (in red in the Merge panel) labels dTrpA1-expressing cells. Scale bar = 50 μm. (B) High magnification image of esophageal neurons expressing Gr66a and TrpA1. To test the role of TRPA1 in neuronal responses to LPS at the cellular level we examined primary cultures of larva brain neurons (Figure 4—figure supplement 2, Harzer et al., 2013) expressing the Ca2+ indicator GCaMP5 under the control of dTrpA1Gal4. LPS (30 µg/ml) reversibly stimulated more than 40% of neurons isolated from control larvae (122/289), and 80% of these were also activated by the dTRPA1 agonist N-ethyl maleimide (NEM, 300 µM) (Kim and Cavanaugh, 2007) (Figure 4A,B). Notably, the proportion of neurons responding to both agents was strongly reduced in cultures derived from dTrpA11 null animals (20/153, P < 10–4, Fisher exact test), as well as by pharmacological inhibition of dTRPA1 with HC030031 in neurons isolated from control animals (4/32, P < 10–3, Fisher exact test). Intriguingly, the responses to LPS or NEM were not fully abolished by genetic or pharmacological ablation of dTRPA1. This suggests that dTRPA1 mediates some, though not all, Ca2+ responses of larva brain neurons to these compounds. To verify this indication in other experimental settings we evaluated the responses of cells isolated from brains of wild type larvae using the ratiometric Ca2+ indicator Fura2, and AITC as reference TRPA1 agonist. Application of LPS (60 µg/ml) reversibly stimulated more than 70% (39/54) of neurons isolated from control larvae (Figure 4—figure supplement 3A,E,F). A large proportion of LPS-sensitive neurons (23/39, 59%) were also activated by 100 µM AITC (Figure 4—figure supplement 3A,E), which indicates that LPS stimulates cells functionally expressing dTRPA1 channels. No Ca2+ response was observed when LPS was applied in the absence of extracellular Ca2+ (0/14, P < 10–4, Fisher exact test; Figure 4—figure supplement 3B,E,F). This indicates that LPS-induced responses result from Ca2+ influx through channels in the plasma membrane, rather than from release from intracellular stores. To directly assess whether LPS induces neuronal responses through the activation of dTRPA1, we tested its effects on wild type neurons in the presence of HC030031 (Figure 4—figure supplement 3C). In these experiments, LPS-induced responses were significantly less frequent (9/32, 28%, P < 10–3, Fisher exact test, Figure 4—figure supplement 3E) and smaller in amplitude (P < 10–3, Mann-Whitney U test, Figure 4—figure supplement 3F) than in control experiments. To confirm these data genetically, we tested the effects of LPS on neurons isolated from dTrpA1-null larvae. These cells responded to LPS with significantly lower frequency (5/23, 22%, P < 10–4, Fisher exact test, Figure 4—figure supplement 3D,E) and amplitude (P < 10–4, Mann-Whitney U test, Figure 4—figure supplement 3F) than control neurons. Importantly, the subpopulation of neurons responsive to both LPS and AITC in cultures from control larvae was absent in cultures from dTrpA1-null animals (Figure 4—figure supplement 3E). Taken together, these data indicate that dTRPA1 channels expressed in the plasma membrane mediate at least part of the Ca2+ influx triggered by stimulation with in Drosophila neurons. Interestingly, as for the experiments with NEM, neither the LPS- nor the AITC-induced responses were fully absent in TrpA1-null neurons. This demonstrates that receptors other than TRPA1 may be also sensitive to these compounds in cultured brain neurons. 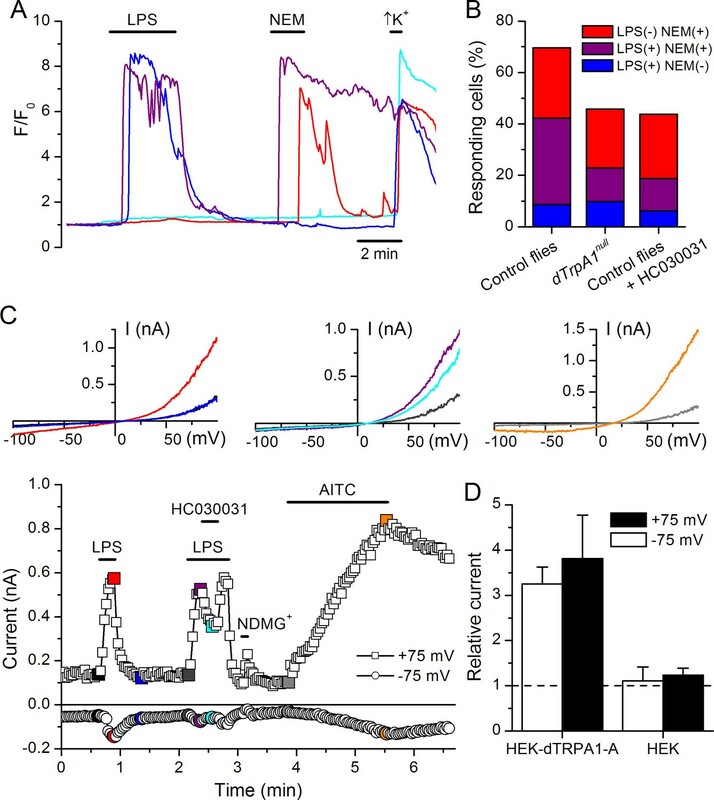 This is in line with previous reports showing that sensory neurons isolated from Trpa1 knockout mice showed reduced, but not completely abrogated responses to LPS (Meseguer et al., 2014), and that TRPA1 is not the only target of electrophilic compounds in sensory neurons (Alpizar et al., 2014; Everaerts et al., 2011; Gees et al., 2013; Ohta et al., 2007; Salazar et al., 2008). Here it is important to note that we used the larval fillet preparation and the neuron cultures as experimental models for native functional expression of dTRPA1. (A) Intracellular Ca2+ imaging in cultured brain L3 neurons expressing RFP and GCaMP5 under the control of dTrpA1Gal4 in baseline conditions and during extracellular perfusion with LPS (30 µg/ml), NEM (300 µM) or high K+ (50 mM KCl). (B) Proportions of neurons responding to LPS (red), NEM (blue) or both (purple). (C) Time course of the currents amplitude measured at +75 and -75 mV during whole-cell patch-clamp recording in dTRPA1-A transfected HEK293T cell. The colored data points correspond to current traces shown at the top of the panel. (D) Average effects of LPS on the current amplitudes recorded at +75 and -75 mV in dTRPA1-A-transfected (n = 7) and non-transfected (n = 3) HEK293T cells. For each cell, the current amplitudes measured in the presence of LPS were normalized to those measured in control condition. Finally, we determined whether dTRPA1 can be activated by LPS in the HEK293T heterologous expression system. We found that 60 µg/ml LPS induced only very few responses in non-transfected cells (7/110), but stimulated a significantly larger fraction of cells transiently transfected with dTRPA1-A (42/74, P < 10–4, Fisher exact test) or dTRPA1-B (14/67, P = 0.007, Fisher exact test) (Figure 4—figure supplement 4). These responses were more variable in amplitude and less frequent than those triggered by AITC, indicating that LPS is a relatively weak agonist of dTRPA1 channels (Alpizar et al., 2013). Further evidence for dTRPA1 activation by LPS was obtained in whole-cell patch-clamp experiments, in which application of LPS significantly enhanced both outward and inward currents in dTRPA1-A transfected HEK293T cells, but not control cells (Figure 4C,D). Application of HC030031 reduced the amplitude of currents recorded in the presence of LPS (35 ± 4% at -75 mV, n = 6, Figure 4C), further confirming the TRPA1-dependence of these responses. Previous results suggest that LPS activates mouse TRPA1 channels by inducing mechanical perturbations in the plasma membrane upon insertion of the lipophilic moiety of the molecule (Meseguer et al., 2014). It is conceivable that LPS activates dTRPA1 channels via the same mechanism, but additional experiments are required to verify this. Taken together, our data demonstrate that fruit flies possess a gustatory mechanism underlying the detection and avoidance of LPS. The avoidance of LPS-contaminated food during feeding and oviposition may serve to prevent Gram-negative bacterial infections, potentially compensating for the lack of adaptive immunity in these animals. The fact that this sensory mechanism exploits dTRPA1 suggests a broadly conserved principle whereby these channels play a crucial role in LPS detection by sensory neurons in flies and mammals, regardless of the particular sensory modality involved. Our findings, together with previous evidence of an olfactory-based detection of secondary metabolites of Gram-positive bacteria (Stensmyr et al., 2012), underscore the need to consider the function of the sensory nervous system as a crucial part of a broad mechanistic understanding of pathogen-host interactions. Drosophila melanogaster strains were raised on standard cornmeal/agar medium supplemented with dry yeast at 25 °C with a 12 hr light/dark cycle. The wild type stock was a w1118strain. The following stocks were obtained from Bloomington Stock Center: w1118;dTrpA11 (BL26504), dTrpA1 RNAi1 (BL31384), w*;dTrpA11, dTrpA1-Gal4 (BL36922), w*; dTrpA1-Gal4 (BL 27593), UAS-RFP (BL 27391), UAS-GCaMP5 (BL 42037), UAS-GCaMP6m (BL 42748). The Gr66a-IRES-GFP vector was kindly provided by Kristin Scott, the NSyB-Gal4;UAS-GCaMP3 was obtained by Patrick Verstreken. The lines Gr66aGal4, UAS-dTrpA1(A);dTrpA1ins,dTrpA1GAL4, UAS-dTrpA1(B);dTrpA1ins,dTrpA1Gal4 and the dTrpA1 RNAi 2 were kindly provided by the laboratory of Paul Garrity. Groups of 20–30 adult males (2–7 days old) were starved for 20 hr in plastic tubes provided with humidified filter paper. After starvation, the animals were allowed to feed on a microtiter dish containing wells alternating 100 mM sucrose alone or with 1 mg/ml LPS, mixed with either a red or blue dye (Supplementary Figure 1, left). This concentration of LPS was chosen in accordance with a previous study reporting concentrations between 250 and 800 µg/ml in water used to rinse fruits and vegetables contaminated with E. coli (Wang et al., 2011). The concentrations in the surface of the food would be therefore much higher than these values, and hence the concentration of 1 mg/ml is likely to be relevant for real scenarios. The feeding preference was assessed by examining the colors of the abdomen and by classifying the flies as red, blue or purple (Supplementary Figure 1, right). The preference index (PI) for the control-containing solutions was calculated as: (nControl - nTest)/(nControl + nTest), where nControl and nTest are the number of flies that ate the control solution (in red or blue color) and the test solution (containing control or LPS, both in red or blue color), respectively. The test solutions were colored with food dyes that showed comparable results: red (food dye or Sulforhodamine B sodium salt, 1 mg/ml) and blue (food dye or Erioglaucine disodium salt, 0.16 mg/ml). Preference data was always represented in box charts in which lines and the dots inside the boxes represent the median and the mean of the data, respectively. Adult flies were allowed to mate for 48 hr prior to test. Males were subsequently discarded and females were transferred to a test tube on top of a 35 mm dish containing food. The food was covered on one side with control solution (water) and on the other side with test solution. The test solution consisted of either E. coli or 1 mg/ml LPS in water. The flies were allowed to lay eggs for 20 hr at 25 °C in a light-proof chamber, after which the amount of eggs on each side of the plate was counted. A preference index (PI) for laying eggs in the control side was calculated as: (nControlSide - nOtherSide)/(nControlSide + nOtherSide), where nControl and nOtherSide are the number of eggs laid in the control and in the other side (containing control, E. coli or LPS), respectively. Two to seven day old flies were starved overnight on wet wipes, anaesthetized on ice, and gently pushed into a pipette tip. The flies were positioned with the head and the proboscis protruding outside the tip edge and the body immobilized within the tip. Flies recovered for 5–10 min before the test and then satiated with water. The solutions were presented as a liquid drop on a syringe tip and the proboscis was touched with the drop for 5 consequent times. During the assay flies were first stimulated with water, to exclude that any response would be due to thirst, and subsequently with 100 mM sucrose alone, as positive control, 100 mM sucrose + 1 mg/ml LPS and finally with 100 mM sucrose again. The extension frequency was calculated as mean frequency of all the samples (n = 19 animals). For each experiment, a fly was secured to an aluminum chamber with wax. The antennae and the surrounding cuticle were removed. The brain was immerged into a bath containing adult hemolymph-like (AHL) solution. The proboscis was partially severed to allow easier penetration of the chemicals. The sub-esophageal ganglion was imaged in vivo from the dorsal side while constantly perfusing the brain with oxygenated AHL saline. The saline containing (in mM): 108 NaCl, 5 KCl, 2 CaCl2, 8.2 MgCl2, 4 NaHCO3, 1 NaH2PO4, 5 trehalose, 15 ribose, 5 HEPES (pH 7.3). GCaMP fluorescence was imaged at 4 Hz using an EMCCD camera (Hamamatsu Photonics) installed on an Olympus BX51 fluorescence microscope (Olympus Corporation). In vivo intracellular Ca2+ imaging was performed in larvae fillets, consisting on surgically exposed brains and ventral nerve cords of wandering third instar larvae. Briefly, larvae were immobilized using pins and stretched out lengthwise in a dish coated with silica and filled with a HL3 solution containing (in mM): 70 NaCl, 5 KCl, 20 MgCl2, 10 NaHCO3, 5 trehalose, 115 sucrose and 5 HEPES (pH 7.3). The larval skin was cut vertically along the dorsal midline towards the rostral end of the larva using spring scissors. At the rostrum of the animal horizontal incisions were made to the left and right. This created a left and a right flap in the body wall. These flaps were then pulled and pinned on the side of the larva to better expose the brain. The organs were removed with forceps and the preparation was immediately used for imaging. Intracellular Ca2+ imaging was performed using a monochromator-based system consisting of a Polychrome V monochromator (TILL Photonics GmbH, Germany), an upright microscope (Olympus, U-TV1X-2, Japan) and a 10X water immersion objective. Images were obtained with an iXon3 888 (Andor, Germany) camera controlled by LiveAcquisition software (TILL Photonics GmbH, Germany). The bath temperature was controlled by a SC-20 dual in-line heater/cooler (Warner Instruments, USA) and an Objective Heater® System (Bioptech, USA). The data were classified semi-automatically using a function programmed in MATLAB (MathWorks, MA) and analyzed with Origin 7.0 (OriginLab Corporation, Northamptom, MA, USA). Primary neuronal cultures were obtained by dissection of the brain complex of third instar larvae, as described elsewhere (Harzer et al., 2013). Dissociated neurons were plated as a 50 µl drop in the center of a coverslip previously coated with a poly-D-lysine/laminin solution. Approximately 40 larvae were dissociated to seed 10 coverslips. Primary neurons were allowed to attach on a coverslip for 2 hr at 25 °C after dissociation. Imaging experiments were performed 3 hr after seeding the cells. Primary neurons in coverslips were washed three times with PBS and subsequently fixed with 4% paraformaldehyde (PFA) for 20 min. After 10 min incubation with 0.1 M glycine, the cells were permeabilize with 0.1% Triton X-100, followed by 20 min incubation with 3% BSA to reduce unspecific protein bindings. Neuronal subset was stained using a rat anti-Elav (Molecular Probes, 1 hr, dilution 1:100), followed by 30 min incubation with a donkey anti-rat Alexa 488 antibody. Three washes with PBS were used to rinsed cells during all experimental steps described during fixation, permeabilization and staining. After immunostaining coverslips were covered with Vectashield mounting medium (Vector Labs) and imaged on an A1-R confocal (Nikon) mounted on a Ti-2000 inverted microscope (Nikon). The images were processed using ImageJ. Experiments were performed at 25 °C using a standard Krebs solution containing (in mM): 150 NaCl, 6 KCl, 1 MgCl2, 1.5 CaCl2, 10 glucose, 10 HEPES and titrated to pH 7.4. In experiments on cells expressing GCaMP5 the fluorescence was measured during excitation at 488 nm using a Nikon Eclipse Ti microscope (Nikon) and the NIS Elements 4.30 software. In experiments on cells isolated from wild type flies we used Fura2 as Ca2+ indicator. Neurons were functionally identified at the end of each experiment by their responsiveness to the application of an extracellular solution containing high K+ concentration. The data were classified semi-automatically using a function programmed in MATLAB (MathWorks, MA) and analyzed with Origin 7.0 (OriginLab Corporation, Northamptom, MA, USA). For the proboscis staining adult heads were dissected in phosphate buffered saline (PBS) and fixed in 3.7% formaldehyde in PBT (PBS + TritonX100 0.1%) for 15 min. The samples were subsequently rinsed three times in PBT and the proboscis were detached from the heads before being blocked in PAX-DG for 1 hr. Following these steps, the samples were incubated with mouse anti-GFP (Roche) and rabbit anti-dsRED (Clonetech) diluted in PAX-DG overnight at 4 °C. This incubation was followed by three washes with PBT and a subsequent incubation with the appropriate fluorescent secondary antibodies for 2 hr at 25 °C. After three rinses in PBT, the proboscis were transferred in 50% Glycerol diluted in PBS and then mounted in Vectashield (Vector Labs) mounting medium. For the legs staining the procedure was modified as follows. Flies were fixed in 3.7% formaldehyde in PBT (PBS + TritonX100 3%) for 4 hr, then subsequently rinsed three times in PBT. The legs were then separated from the body and left O/N in the fixing solution. Human embryonic kidney cells, HEK293T, were seeded on 18 mm glass coverslips coated with poly-L-lysine (0.1 mg/ml) and grown in Dulbecco’s modified Eagles medium containing 10% (v/v) fetal calf serum, 2 mM L-glutamine, 2 U/ml penicillin and 2 mg/ml streptomycin at 37 °C in a humidity controlled incubator with 10% CO2. Cells were transiently transfected using Trans-IT-293 reagents (Mirus, Madison, MI, USA) with dTRPA1-A or dTRPA1-B (kindly provided by Paul Garrity) cloned into the pCAGGSM2-IRES-GFP vector. For intracellular Ca2+ imaging experiments cells were incubated at 37 °C with 2 µM Fura2-AM ester for 30 min before the recordings. Intracellular Ca2+ concentration was measured on an Olympus Cell^M system at 23 °C. Fluorescence was measured during excitation at 340 and 380 nm, and after correction for the individual background fluorescence signals, the ratio of the fluorescence at both excitation wavelengths (F340/F380) was monitored. In all experiments transfected cells were identified by GFP expression and sensitivity to the TRPA1 agonist AITC. Whole-cell membrane currents were measured at 23 °C with an EPC-10 patch-clamp amplifier and the softwares Pulse (HEKA, Lambrecht/Pfalz, Germany) and Clampex (Axon Instruments, Sunnyvale CA, US). Currents were digitally filtered at 2.9 kHz, acquired 20 kHz and stored for off-line analysis on a personal computer. Cells were recorded in an extracellular solution containing (in mM): 140 NaCl, 5 KCl, 10 HEPES, 2 CaCl2, 2 MgCl2, 10 glucose, pH titrated to 7.4 with NaOH. The pipette solution contained (in mM): 120 Cs-Aspartate, 5 EGTA, 10 HEPES, 1 MgCl2, pH titrated to 7.4 with CsOH. Non-transfected HEK cells were used as control. Whole-cell currents were elicited using a 200 ms voltage ramp from -110 mV to +110 mV every 2 s from a holding potential of -40 mV. NMDG+ (N-methyl-D-glucamine) was used to monitor the size of the leak currents during the patch-clamp recordings (Meseguer et al., 2011). Electrophysiological data were analyzed using WinASCD software (Guy Droogmans, KU Leuven) and Origin (OriginLab Corporation, Northamptom, MA, USA). Origin was also used for statistical analysis and data display. We used LPS extracted from E. coli, strains 055:B5 and 0127:B8. AITC was kept at 4 °C as a 100 mM stock solution in ethanol and fresh dilutions were prepared daily. All chemicals were purchased from Sigma-Aldrich (Bornem, Belgium). Innate immunity, Cellular and Molecular Immunology, Elsevier Saunders. PflüGers Archiv : European Journal of Physiology 466:507–515. Current Biology : CB 21:316–321. Frontiers in Cellular Neuroscience, 4, 10.3389/fncel.2010.00020. The Journal of Neuroscience : The Official Journal of the Society for Neuroscience 27:6500–6509. Proceedings of the National Academy of Sciences of the United States of America 107:8440–8445. The costs of immunity and the evolution of immunological defense mechanisms, Mechanisms of Life History Evolution: The Genetics and Physiology of Life History Traits and Trade-Offs, T. Flatt and A. Heyland, Oxford University Press, 10.1093/acprof:oso/9780199568765.003.0023. PflüGers Archiv : European Journal of Physiology 464:425–458. Journal of Microbial & Biochemical Technology 03:26–29. Frontiers in Behavioral Neuroscience, 8, 10.3389/fnbeh.2014.00254. Handbook of Experimental Pharmacology 222:583–630. Thank you for submitting your work entitled "Gustatory-mediated avoidance of bacterial lipopolysaccharides via TRPA1 activation in Drosophila" for consideration by eLife. Your article has been favorably evaluated by K VijayRaghavan (Senior editor) and three reviewers, one of whom is a member of our Board of Reviewing Editors. One of the three reviewers has agreed to reveal his identity: Hubert Amrein. This manuscript examines mechanisms for detection of a bacterial lipid, LPS. 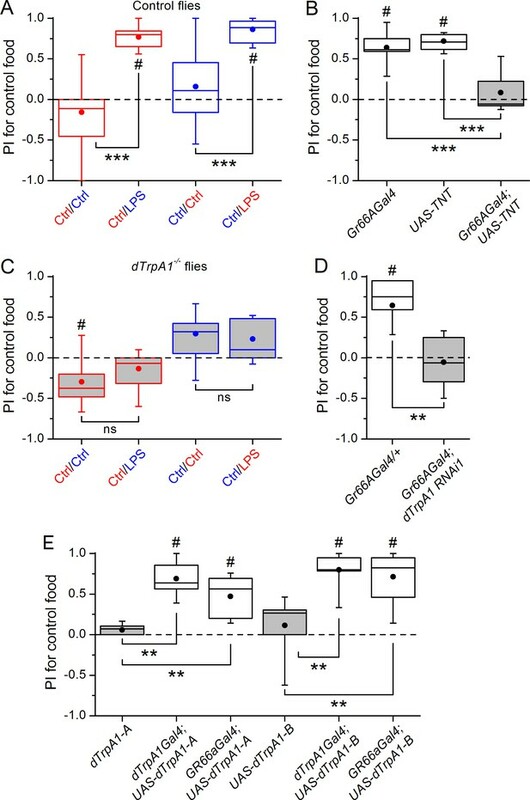 The authors show that flies avoid LPS, this avoidance requires bitter gustatory sensory neurons, and TRPA1 expressed in bitter neurons is essential for aversion. By misexpression studies, the authors show that TRPA1 is activated by LPS. The study is interesting, identifying a potential receptor and sensory mechanism in Drosophila for bacterial detection (with evident selective advantage for an animal that feeds upon microbe-rich substrates), and broadening the sensory profile of the well-characterized Gr66a gustatory "aversion" neurons. Overall, the behavioral experiments are rigorous and convincing. The functional studies of LPS-mediated activation of TRPA1 require additional experiments to link the behavioral and cellular phenotypes. 1) Straight-forward methods (Ca2+ imaging and electrophysiological recordings) are established to monitor cellular responses of taste neurons. 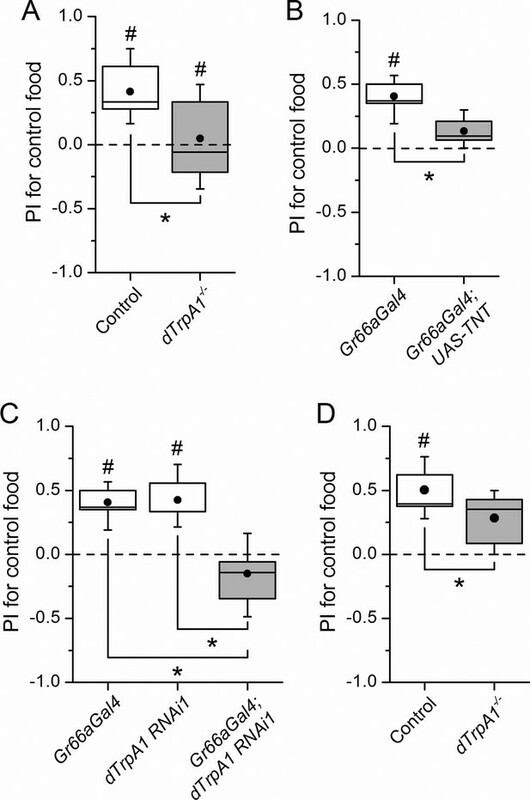 The authors need to monitor the responses of bitter gustatory neurons in wt, trpA1 mutant, and trpA1-/-; Gr66a-GAL4, UAS-trpA1 rescue flies to show that LPS activates these neurons and requires TRPA1. This is essential to link sensory detection of LPS to the behavioral response. 2) Figure 3A legend states that the experiment was done in isolated neurons expressing GCaMP and RFP in dTRPA1-Gal4 neurons. In the text, it states that primary cultures were examined using Fura2 (Results and Discussion, fifth paragraph). The experiments should be done using GCaMP expressed selectively in dTRPA1-Gal4 cells (if they were not). The number of cells responding in trpa1 mutant and WT with HC is confusing (Figure 3B) and will perhaps be resolved if only TRPA1-expressing cells are being studied. 3) LPS are very different in structure and much larger than AITC and other TrpA1 ligands. Discussion of the structure of LPS and discussion of which part of LPS (polyglycan, lipid) is critical to activate TrpA1 would be useful. In addition, LPS concentration used (0.1%) should be compared to the concentration of LPS in bacterially contaminated food. Thank you for resubmitting your work entitled "Gustatory-mediated avoidance of bacterial lipopolysaccharides via TRPA1 activation in Drosophila" for further consideration at eLife. Your revised article has been favorably evaluated by K VijayRaghavan as the Senior editor and a Reviewing editor. The calcium imaging data added in the revision should be removed. The responses are too inconsistent to interpret and the manuscript is stronger without this data. If the resubmission were modified to state that the experiment was attempted but that there were challenges associated with stimulating mouthpart neurons and direct brain application gave varying results, this would enhance the manuscript. As previously described in the literature (Kang et al., Nature 2010, 464:597-600) and as demonstrated in the newly added data (new Figures 3 and Figure 3—figure supplement 1, the immunofluorescence from labellum and leg), dTrpA1 is expressed in a subset of Gr66a bitter-sensing gustatory neurons present in the labellum and in the pharynx, but not in the legs. We are persuaded that the neurons involved in the LPS detection are the ones present in the pharynx, where they detect potentially harmful substances upon food ingestion, before reaching the digestive tract. This is strongly supported by the fact that LPS is avoided by flies when examined with a two-choice assay, but does not inhibit the proboscis extension reflex (new Figure 3—figure supplement 2). Together, these data strongly support the involvement of internal sensory neurons in the detection of LPS rather than labial sensory neurons. It was not possible to perform electrophysiological recordings because this technique allows only recording from external sensory neurons that are easily accessible (Benton and Dahanukar Cold Spring Harbor protocols 2011, 2011:839-850). To our knowledge there reports of recordings performed from internal sensory neurons. Similarly, we did not find any example in the literature of Ca2+ imaging used to monitor the responses of pharyngeal GRNs. However, performing intracellular Ca2+ imaging in a perfusion system allowed us to analyze the responses of the neuronal terminals in the sub-esophageal ganglion (SOG) upon stimulation of the gustatory nerves and the neuronal terminals themselves, therefore overcoming the accessibility issue. We focused on using Ca2+ imaging to determine if LPS elicits Ca2+ responses to LPS in the SOG. We visualized the projections of bitter-sensing neurons in the SOG by opening a window on the fly head cuticles and submerging the fly head into AHL solution (Marella et al., Neuron 2006, 49:285-295). We analyzed Gr66aGal4:UAS-GCaMP6m flies and used caffeine as a positive control for bitter-sensing gustatory neuron activation (Marella et al., Neuron 2006, 49:285-295) and allyl isothiocyanate (AITC) as a control for dTRPA1 activation. As shown in the new Figure 3, we found that application of LPS induces neuronal activation. Not surprisingly, the responses were variable in amplitude and duration, and we could not observe them in all analyzed brains. We are convinced that this was not due to technical issues because all samples responded robustly and consistently to caffeine and AITC. We believe that the variability of the responses to LPS is due to the intrinsic nature of the molecule itself. LPS, is a very large molecule consisting of a lipophilic moiety (lipid A), a polysaccharide core, and a highly variable O-polysaccharide. Therefore, LPS may not diffuse well through the tissue, in contrast to classic tastants such as caffeine. In the experiments we performed LPS was applied to an in vivo preparation where it has to access the projection of bitter-sensing neurons that are located in a deep part of the preparation. Moreover, as shown in the Ca2+ imaging experiment in Figure 3, LPS induces a specific but rather mild activation of dTrpA1-expressing neurons. In conclusion, our evidence strongly supports the specificity of the activation of Gr66a neurons by LPS, but due to the variability of the effects observed we do not think that analyzing this response in the dTrpA1 null animals and genetic rescue would be much more informative. Moreover, our other data clearly demonstrate that dTrpA1 is necessary and sufficient for LPS detection as shown in Ca2+ imaging experiments (Figure 3) and specifically in the Gr66a neurons in the two-choice assay (Figure 1). 2) Figure 3A legend states that the experiment was done in isolated neurons expressing GCaMP and RFP in dTRPA1-Gal4 neurons. In the text, it states that primary cultures were examined using Fura2 (Results and Discussion, fifth paragraph). The experiments should be done using GCaMP expressed selectively in dTRPA1-Gal4 cells (if they were not). There was indeed a mistake in the text, thank you for pointing this out. In these experiments we used neurons isolated from animals expressing RFP and GCaMP5 under the control of TrpA1-Gal4. The text referring to this figure is now corrected (Figure 4 in the current version of the manuscript). The number of cells responding in trpa1 mutant and WT with HC is confusing (Figure 3B) and will perhaps be resolved if only TRPA1-expressing cells are being studied. It is indeed true that the responses to LPS and NEM are not completely absent in the neurons isolated from TrpA1 mutant flies, nor in wild type neurons exposed to the TRPA1 inhibitor. By no means have we wanted to claim that TRPA1 is the only target for LPS and NEM in these neuronal cultures. Please, note that this preparation serves as a model for endogenous TRPA1 expression, but may bare no direct relevance to the avoidance to LPS observed in the behavioral experiments. However, these experiments clearly show that the neuronal population responding to both LPS and NEM is reduced by genetic or pharmacological ablation of TRPA1. To confirm the role of TRPA1 in the responses to LPS we performed another series of experiments, using the ratiometric dye Fura2, and AITC instead of NEM as reference dTRPA1 agonist. The results, now shown in the new Figure 4—figure supplement 3 support the idea that TRPA1 contributes to the responses to LPS in a native expression system. Activation of TRPA1 by LPS was clearly demonstrated by the results of our patch-clamp experiments, which show that LPS enhances dTRPA1 currents in a heterologous expression system. 3) LPS are very different in structure and much larger than AITC and other TrpA1 ligands. Discussion of the structure of LPS and discussion of which part of LPS (polyglycan, lipid) is critical to activate TrpA1 would be useful. We would like to point out that, given the unusual chemical structure of LPS, the elucidation of the molecular mechanism underlying its action on TRPA1 represents a major undertaking, requiring numerous and sophisticated biophysical approaches that go far beyond the scope of the present study. In addition, LPS concentration used (0.1%) should be compared to the concentration of LPS in bacterially contaminated food. LPS concentrations can be expected to be very high, especially in the ecological niches of fruit flies. Although we did not attempt to measure these concentrations ourselves, the literature reports values between 250 and 800 µg/ml in water used to rinse fruits and vegetables contaminated with E. coli (Wang et al., J Microbial Biochem Technol 2011, 3:26-29). It is therefore expected that the concentrations in the surface of the food would be much higher. Considering this, we are confident that the concentrations we used in our behavioral experiments, and in our experiments in vitro are relevant for real scenarios. We now include a statement on this in the Materials and methods section (Binary choice food preference) to comply with the suggestion of the referee. Furthermore, in our revised manuscript we now include new results of egg laying experiments aimed at testing the ability of flies to avoid bacteria (E. coli). As shown in Figure 2D, control animals show a marked preference for laying eggs on food without bacteria. In contrast, dTrpA1 null mutants showed no bacterial avoidance, suggesting that dTRPA1 is important for bacterial detection. Taken together, these arguments indicate that the concentration of LPS we used can be detected by fly as sign of bacterial infection and that the LPS detection is a physiologically relevant mechanism that allows avoidance of infected food. We are very grateful to Paul Garrity for reagents and discussion of the data during the initial part of the project and to Patrik Verstreken for the NSyB-Gal4;UAS-GCaMP3 flies. We thank Zeynep Okray for her help with larval dissections, Koenraad Philippaert for his help with in vivo Ca2+ imaging experiments, and members of the laboratories of Ion Channel Research (KU Leuven) and Neurogenetics (VIB) for helpful discussions. This work was funded by grants from the Belgian Federal Government (Belspo; IUAP P7/13), the Research Council of the KU Leuven (GOA/14/011, OT/12/091 and PF-TRPLe), VIB and the Research Foundation-Flanders (FWO) (G.0702.12, G.0C77.15, G.0680.10, G.0681.10, G.0503.12, G.0654.15, G.0761.10N, G.0596.12 and G.0565.07). AS and YAA hold Postdoctoral Mandates from KU Leuven. BB is funded by a Ph.D. grant of the Agency for Innovation by Science and Technology (IWT, Flanders, Belgium), GL by the FliAct Marie-Curie Initial Training Network, and LF is by a fellowship from the VIB International Ph.D. Program. BAH is an Allen Distinguished Investigator and an Einstein Visiting Fellow of the Berlin Institute of Health. © 2016, Soldano et al.